The Minister of State at the Department of Finance has warned the banking industry that it is on its "last chance" to restore public trust in its institutions. 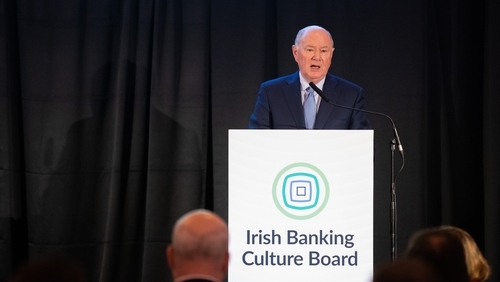 Speaking at the launch of the new Irish Banking Culture Board, which aims to bring about cultural change at the banks, Michael D'Arcy said the financial crisis and tracker mortgage controversy had done "terrific damage" to financial institutions. Mr D'Arcy said it was clear that public trust in banking is diminished and a rebuilding of that trust is long overdue, with the new board playing a crucial role in that. "I believe the Irish Banking Culture Board can make improvements to banking culture, but these changes need to take place within the banks," he said. Some areas that could be focused on, he claimed, might include removing the mismatch between staff incentives and customers best interests and empowering staff to speak up within their organisations where wrongdoing or failure to follow best practice are observed. He said the industry and individuals within it need to take ownership of the change, adding that in his view, this is the banking industry's last chance. The junior minister also said the insurance industry should consider setting up a similar culture board. The chairman of the new board, Mr Justice John Hedigan, said he is cautiously optimistic that a change in the culture of banking here can be brought about. He said he naturally has a health skepticism about the endeavor, which he said he considers to be a worthy and worthwhile one. "Now is the time, now is the time, to regain public trust in the Irish banking system," he said. "All sections of Irish society are crying out for this trust, essential to our country and to the ongoing prosperity of our people, to be restored to an industry where for so long it was safely reposed." "This is the message relayed loud and clear in our public consultation process upon which we report today. This is the mission of the Irish banking culture board." Details were also given at the launch of the makeup of the board. Seven members will come from outside the banking. Among them are financial advisor Padraic Kissane, who has worked extensively with customers mistreated by the banks, Angela Black, Chief Executive of the Citizens Information Board, Sue O'Neill, Chair of the Small Firms Association and Martin Stapleton from the Irish Farmer's Association. A further five members will come from the banking sector. Mr Justice Hedigan said he is impressed by the obvious commitment to change that is implicit in the preliminary procedures carried out by the organisation, prior to him joining it. "The banks have shown that they are prepared to hear what people do not usually want to hear about themselves, in order to discover the full extent of the task of regaining public trust," he said. "They are prepared to entrust to an independent chair and an independent board the task of facilitating, monitoring and reporting upon progress in that task." Mr Justice Hedigan said the purpose of the board is nothing less than to assist the banking sector to identify, strive for, achieve, maintain and measure the highest ethical standards in banking and confidence and to refocus on the customer to ensure fair and humane outcomes for customers, particularly those in trouble. "Concrete identifiable and institutional change is required to ensure that these goals are achieved and maintained. This is what the banks have committed to. I salute that commitment." He said he wants the board to be a critical friend to the banking industry. "This is also a chance for the banking sector to give back something of real value in recognition of the extraordinary sacrifices made by the Irish people to save our banks," he told the gathered audience. He said hope exists and we cannot allow that hope to be dashed, but he warned the change would not happen overnight and will take time. Also addressing the launch, Derville Rowland, Director General Financial Conduct at the Central Bank, said she welcomed the board's establishment. But she said it would never be a substitute for effective regulation, assertive supervision or robust enforcement. She said early signs of progress at the banks were not before time, particularly in the context of the treatment of customers impacted by the tracker mortgage controversy. "The scale of the tracker mortgage scandal can be measured by the fact that the banks, you, returned €665 million to almost 40,000 customers and a substantial number of those were only included in redress and compensation after they were challenged by the Central Bank," she told the room full of industry representatives. She said the behaviour and culture report published by the Central Bank last year found a very mixed picture in the banks. What the regulator wants to see, she said, is a clear call out on the behavioural change that banks expect to see, she warned. The Central Bank also wants to see the board of the banks own that change and drive it forward, she said. She added that it was not enough to talk the talk, and the banks have to walk the walk as well. "The Central Bank will closely monitor and challenge the banks on the delivery of the behaviour and culture plans in the period ahead. But in the immediate term we expect to see significant developments by each bank in terms of behavioural and structural changes and the design of controls that will support sustainable cultural change," she added. Among the key findings of a survey of 25,000 banking staff around banking culture, which was commissioned by the board and carried out by the British Banking Standards Board, were that nearly a fifth see a conflict between their bank's stated values and how business is done. 19% said they did not believe their bank puts customers at the centre of business decisions. A third said they had wanted to raise a concern at work over the last 12 months and of those that raised the concern, less than 2 in 5 felt they had been listened to and taken seriously. More than half of bank employees said they feel under excessive pressure at work. 15% said they had seen instances where unethical behaviour was rewarded and 20% said it was difficult to make career progression without flexing ethical standards. A separate survey of the public and stakeholders found 83% want banks to act in accordance with and held accountable to the highest possible ethical standards. 61% said they wanted customers to be treated fairly while a similar percentage want a culture of transparency promoted. The Banking & Payments Federation Ireland has welcomed the establishment of the board and said it was "a further step in rebuilding trust in the sector and embedding a customer-focused culture."